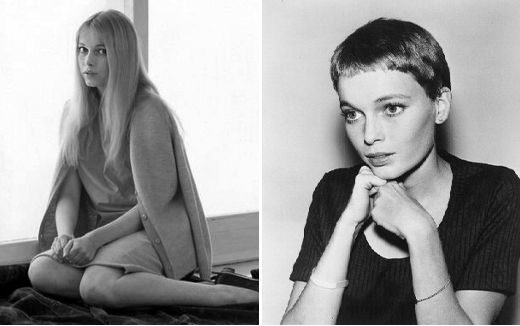 One morning in 1965, Mia Farrow arrived for work on the set of Peyton Place looking decidedly different: she had, overnight and without warning, chosen to have the majority of her long hair chopped off. To make matters worse for an instantly panicked crew, filming was currently mid-episode. 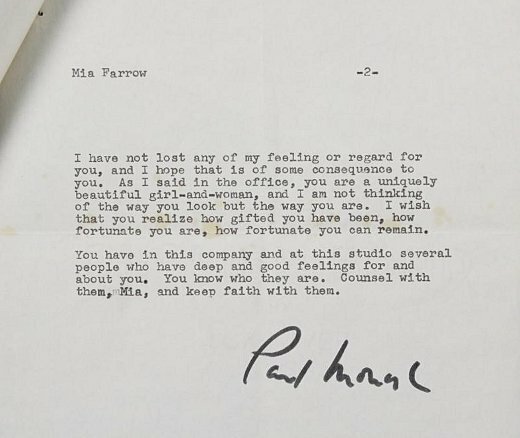 A few days later, with crisis averted following a hasty re-write that saw Farrow's character cut her hair during an amnesia-induced nervous breakdown, the show's producer, Paul Monash, wrote the following cautionary letter of advice to the actress. Transcript follows. Image courtesy of Julien's Auctions. I am writing to you both as a friend and as an employer. When you came into my office Friday, after cutting your hair, you expected me to be angry with you. I did not show anger, because that seemed pointless; and I didn't really feel anger, because the potential damage was more to you than to me or to the series or to the studio. 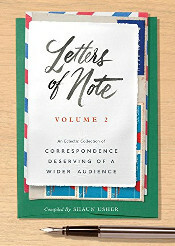 And that is what I am writing about to you. It so happens, Mia, that we are able to accomodate the storyline to your action. But it might very well have happened that we could not. In that case, you would have injured all those who depend upon this series. That is something to consider. You have a legal contract with us and a moral contract with all those who work with you. And you have a conscience which tells you both must be kept. 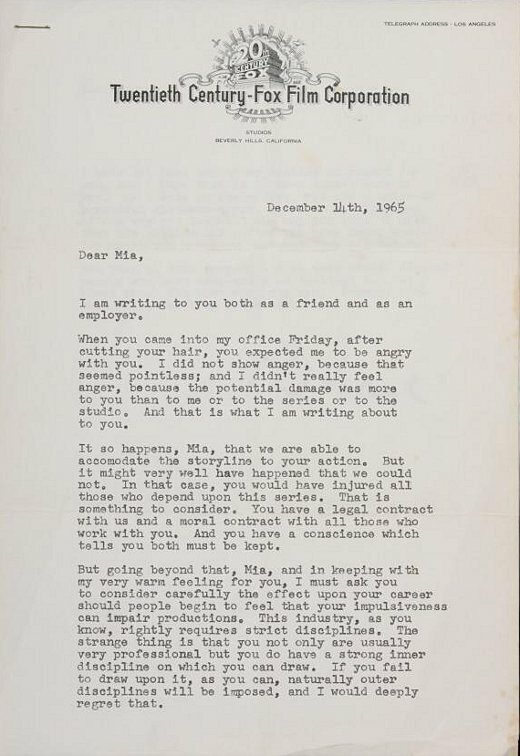 But going beyond that, Mia, and in keeping with my very own feeling for you, I must ask you to consider carefully the effect upon your career should people begin to feel that your impulsiveness can impair productions. This industry, as you know, rightly requires strict disciplines. The strange thing is that you not only are usually very professional but you do have a strong inner discipline on which you can draw. If you fail to draw upon it, as you can, naturally outer disciplines will be imposed, and I would deeply regret that. 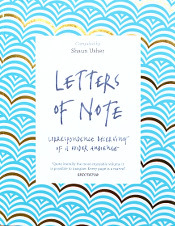 I have not lost any of my feeling or regard for you, and I hope that is of some consequence to you. As I said in the office, you are a uniquely beautiful girl-and-woman, and I am not thinking of the way you look but the way you are. I wish that you realize how gifted you have been, how fortunate you are, how fortunate you can remain. You have in this company and at this studio several people who have deep and good feelings for and about you. You know who they are. Counsel with them, Mia, and keep faith with them.